Left-to-right, Marietta College alumni Bill White, ‘69/’78; Aleece Dye, ’11; and Steven Hollis, ’10, on the set at Osborn Photographic Illustration, Williamstown, WV. In late 2010, when OffWhite needed a photographic model to help illustrate a new line of low temperature freezers used for pharmaceutical and medical research, the creative team turned to the nearest available resource – our intern, Aleece Dye, ’11. Now an MC graduate and the college’s Assistant Director of Chapter and Young Alumni Programs, Aleece was the 23rd intern to work at OffWhite since the firm was established in 1985. 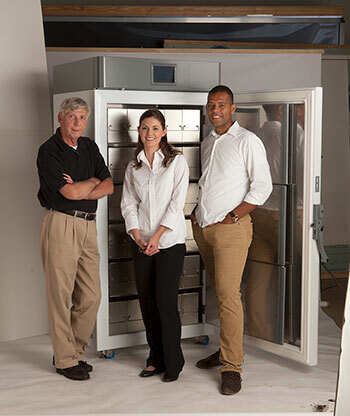 OffWhite CEO Bill White (‘69/’78) and Creative Director, MC Adjunct Professor (Graphic Design) Abby Spung, asked Aleece to model a client’s new portable freezer designed for cold chain storage and safe transport in clinical trials. From the lab to the field, Aleece completed a series of photos that communicated the portability and utility value of the industry’s most unique ultra-low freezer. A few months later, a new freezer was introduced and Aleece, again, was asked to provide visual context on another photo shoot. Fast forward a couple of years and the client company’s long-awaited upright freezer is introduced, a mainstay in pharma, biotech, medical research labs and biorepositories worldwide. Ergonomic benefits of the larger freezer offer significant advantages over competitive designs, therefore a photo model was essential to communicating interior access in the marketing roll-out. Who better than Aleece? And who better to direct the shoot than Marietta College graduate Steven Hollis, ’10, a former student of Abby’s and now a graphic designer at OffWhite. Today, the client company’s product line includes continuity in industrial design as well as brand continuity expressed, in part, by the use of the same photo model, Aleece Dye, an OffWhite intern who not only gained valuable experience on the job in our office, but gave back to our firm in so many ways. Because stability is a valuable part of how an emerging growth company is perceived by a demanding market, Stirling Ultracold, based in Athens, Ohio, now has a quality visual portfolio to match the high technology engines powering the most sustainable vaccine storage solutions in the world. Thanks, Aleece, Abby, Steven and the entire OffWhite team for a great effort. Is Your Website Navigation Working for You? One of the keys to Search Engine Optimization is organizing your website so that it gives your visitors a great experience, while making it usable for search engines. At OffWhite, we talk about information mapping, creating a logical overview of your business (who you are, products, services and more). The result of an OffWhite website information mapping project becomes your site architecture - how each page on your website interacts with every other page. It's the way people and search engines navigate your website, and we want it to be easy for both humans and search engine bots to find what they are looking for. The way your website's navigation is set up has a huge impact on which of your pages and keywords rank on search engines. Pages that have lots of internal pages linking to them are easy for visitors and search engines to find, have high internal link popularity scores, and give your site a better chance of ranking on competitive keywords. There is a hierarchy to the link popularity of pages on your website, starting with your home page. Typically, every page on your website has a link back to the home page, making it the most popular page on your website. You can take advantage of this link popularity to get higher rankings when you optimize your home page for general and highly competitive keywords. Next, top-level pages (pages that appear in global navigation bars) are ideal for optimization since there are many opportunities for product or service category listings and quick links to information found deeper in the site. These pages should be optimized for fairly competitive keywords pertaining to the website section. The next level of website hierarchy is typically the product or service pages. These pages can be optimized for the names of the products and services, and keywords should be more specific and long tail. The final level of your website navigation is made up of additional content from blogs, news articles, videos, etc. This information helps you establish your expertise and credibility, and often generates external links. These pages are good at bringing in search engine traffic from long-tail keywords. To learn more, or to set up a meeting to discuss your website architecture, contact Jane Cirigliano at OffWhite. Each year, we open our office for the Ohio River Sternwheel Festival. It's the perfect location for friends, family and clients to gather to enjoy the festivities and watch the fireworks. We began a new tradition in 2011. 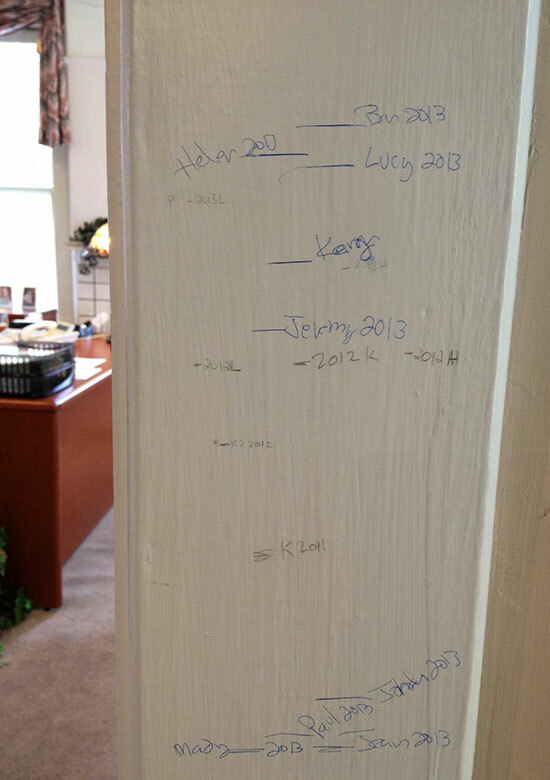 We designated a doorway in the entrance of our office to measure the growth of all of the children who join us. We even have them predict how tall they think they will be next year. Thanks to all of the OffWhite family for making this year's Sternwheel Festival one to remember. When was the last time you examined your inbound marketing strategy? Does it include social media and SEO? If you can’t recall, you’re past due. According to Hubspot’s State of Inbound Marketing in 2013 report, social media is gaining importance quickly when it comes to B2B lead generation and inbound marketing. Their survey confirms that the days of traditional outbound marketing are losing ground. Thanks to spam filters, do not call lists and other filtering tools, these methods aren’t nearly as effective as they used to be. In fact, only 22 percent of all leads in 2013 came from outbound marketing, says Hubspot. Social media and SEO are successful lead generators because they allow consumers to control the way and extent that they engage with businesses. Interacting with your followers through social is a good way to let them get to know you without asking for anything from them. There are several social media channels out there, so where do you start? Well, it depends on your business and audience really, but these figures should help you out. Facebook tops all other channels in customer acquisition for 2013. Let customers come to you by leveraging an active inbound marketing program. Be prepared when they arrive with logical, quality content and calls to action to convert visitors into customers. To learn more about how you can use inbound marketing to grow your business, contact Jane Cirigliano.